Our mission is to protect and enhance Oregon's fish and wildlife and their habitats for use and enjoyment by present and future generations. See our Budget Information page. A third of ODFW’s budget comes from the sale of hunting and fishing licenses. Another third comes from the federal government through grants that are mostly tied to the sale of hunting and fishing equipment. Though ODFW manages fish and wildlife for all Oregonians, less than 5 percent of ODFW’s budget comes from Oregon’s general tax dollars and the lottery. 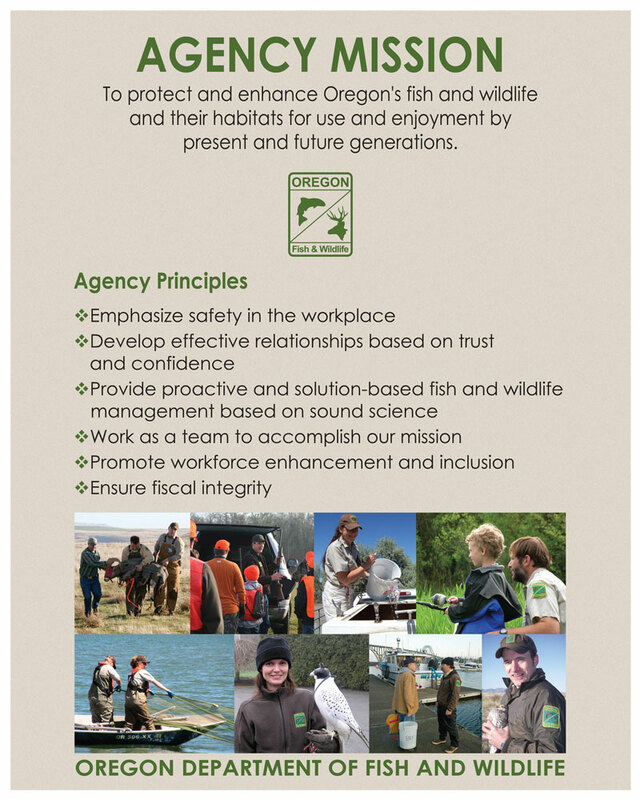 Oregon’s fish and wildlife policies are set by the Fish and Wildlife Commission, a seven-member volunteer board. Its monthly meetings are open to the public. Commission members are appointed by the Governor. ODFW is headquartered in Oregon’s capitol city of Salem. The agency works through a regional management structure that allows for fish and wildlife management at the local, watershed level. Its local field offices are divided into two regions (West and East) with four to six watershed districts in each of those regions. Want to work for ODFW? Positions are advertised on our Jobs page. Most of ODFW’s purchasing and contracting under $5,000 occurs with ODFW regional offices in Clackamas and La Grande. Purchases of over $5,000 are done through the Oregon Procurement Information Network (ORPIN). Opportunities to participate in competitive purchases can be found on the state’s ORPIN site. For more information, contact ODFW Contract Services at ODFW.ContractsInbox@state.or.us, 503-947-6131 or your local regional office. Want to grow your business in Oregon? Click here to learn how to become a certified firm in Oregon. Visit our social media page to find links to our Facebook, Twitter, YouTube and Flickr pages. Sign up for email alerts or RSS feed or visit or call one of our local offices, hatcheries or wildlife areas.